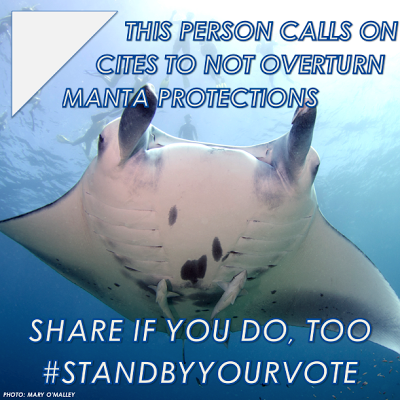 On Monday, March 11, 2013, CITES Committee I approved protections for five species of shark and two species of manta ray. The results of Committee I will head to plenary and will be approved in about 48 hours. There is a chance that opposing countries will move to reopen the vote and possibly overturn these protections. Shark Defenders, Shark Savers, WildAid, and Manta Trust are working to keep this from happening, and we need your support. Please send an email to the delegates from the countries listed below asking them to stand by their vote. 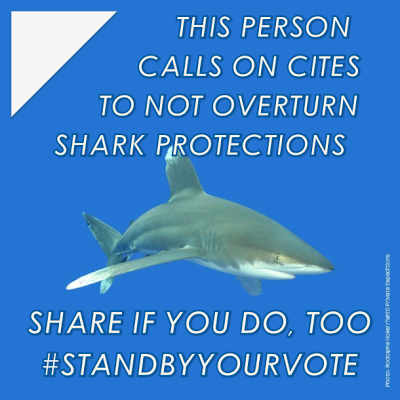 Clicking on the links will open an email message box addressed to the CITES delegate from that respective country with "Stand By Your Vote - Don't Reopen CITES Shark Vote" in the subject line. Please write a quick message (or not, the subject line is enough) and hit send. We need governments to know that the world wants shark protections*. ***Thank you for your emails! The last day of CITES has begun and the decision is now in the hands of the delegates. Follow us on Twitter for live updates. On the run up to an important decision where many many supportive countries have been working tirelessly to secure a successful vote having hundreds of emails sent to country representatives is very unhelpful and unproductive. This is more likely to undo all the hard work that has taken place at this meeting. Please consider whether this really is the best way to achieve your goals. Yesterday I tried the link for UK and it did not work. Today I cannot see UK listed there.